This summer give your shoe collection an uplift with espadrilles from Neiman Marcus. We offer a variety of espadrille flats and wedges in distinct styles for women in an array of colors. Attractive designs and supreme functionality combine together to make them timeless. Our collection of denim and leather espadrilles is available in various sizes and fits. Stylish and comfortable, they are suitable for any occasion. From wedding parties to weekend getaways, our designer collection of espadrilles will set you up for all your outings. All our espadrilles are made from high-quality materials. Shop colorful and designer espadrilles for women at Neiman Marcus. Brunello Cucinelli pebbled leather espadrille sandals. 4.3" braided-jute wedge heel; 1" platform; 3.3" equiv. Wide monili-beaded strap bands open toe. Brunello Cucinelli pebbled leather espadrille sandals. 4.3" braided-jute wedge heel; 1" platform; 3.3" equiv. Wide monili-beaded strap bands open toe. Adjustable ankle straps. Leather lining. Rubber outsole. Made in Italy. 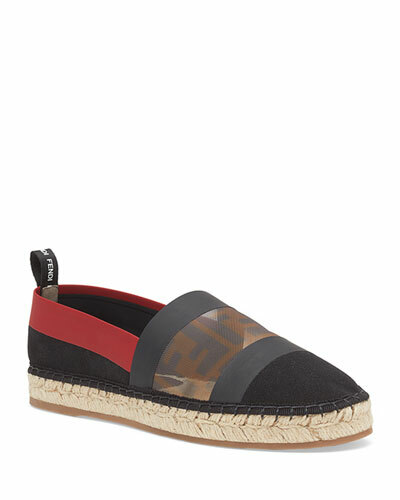 Eileen Fisher espadrille sandal in leather and nylon mesh. 1.5" braided-jute platform heel. Strap bands open toe. Gathered knot detail at ankle. Back zip eases dress. Leather footbed. Rubber outsole. Eileen Fisher espadrille sandal in metallic leather and nylon mesh. 1.5" braided-jute platform heel. Strap bands open toe. Gathered knot detail at ankle. Back zip eases dress. Leather footbed. Rubber outsole. 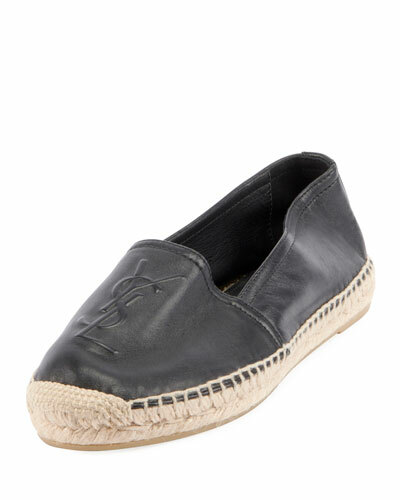 Gentle Souls by Kenneth Cole espadrille in perforated and smooth metallic leather with braided-jute trim. 1.5" wedge heel. Peep-toe. Center-notch vamp. Slip-on style. Leather lining. Rubber outsole. "Luci" is imported.